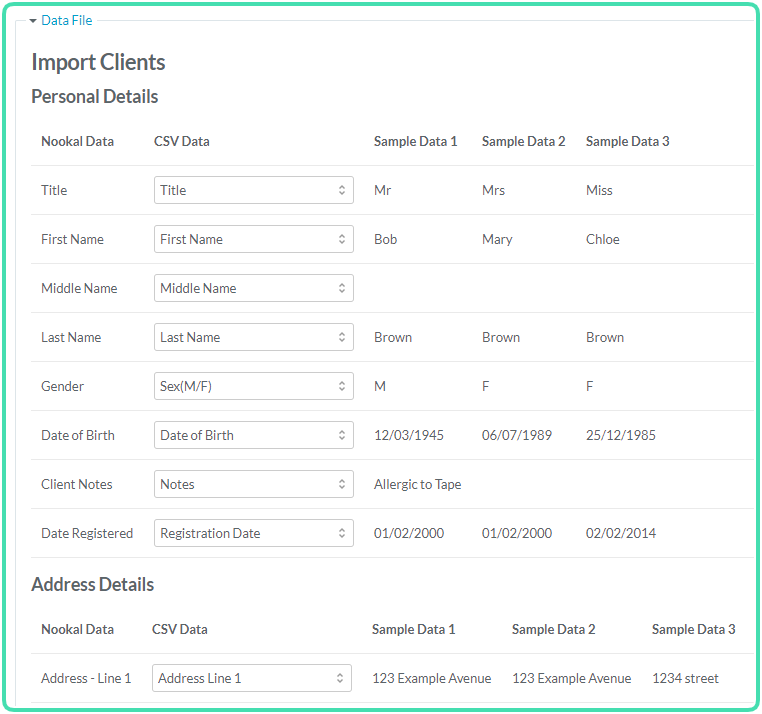 With Nookal, it is possible to import Client and Contact data from a previous software or from a spreadsheet as long as it is in a format compatible with CSV files. CSV files can be created from different programs such as Microsoft Excel, Apple Numbers and other spreadsheet software programs. The import tool is only used to import Client demographics and Contact details. To import additional data such as client accounts, appointment history, clinical notes, documents, etc, please get in touch by creating a ticket and we will provide further assistance. Once the CVS files are ready, they can be uploaded. 2. 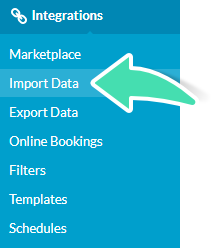 Click Import Data under Integrations. 3. Select which type of data will be imported, Clients or Contacts. 4. Click Choose file to browse in computer files to select the file to upload. 5. Click Upload. The selected file’s title will be displayed. These next steps are very important to make sure the import is accurate. 6. Select which Location your data will be connected to, All Locations or a specific location. 7. Select if the document has a header or not. 8. Choose if the data should be added to existing data in the Nookal account or if the new data will replace the existing data. If the option Delete Clients is selected, All the existing Clients will be deleted and it is irreversible. 9. Verify that each field of data fields contains the right type of data under CSV Data or click on the arrow to change it. Make sure the dates are in the proper format (DD/MM/YYYY) because they are often formatted as standard numbers when exported to a CSV file. If this is the case, the format will need to be changed using a spreadsheet software (e.g. Microsoft Excel). This needs to be done before importing the data, otherwise the data will not be recognised and the date fields will not be imported. 11. A pop-up window will confirm the upload is being processed. Click OK.
12. 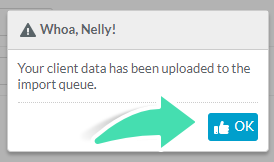 The Upload Queue will show the files pending. It can take a few minutes to a few hours to be uploaded depending on the amount of data to be uploaded. 13. Once the upload is Completed, the status will be updated.